From the beginning, Sonny has always been a sensory seeker. As a baby he was a super cuddly-koala clinging-touchy feeling- octopus. As he grew older, he lessened his grip on me and began to enjoy playing with toys of his narrowed interests. Anything trains or Disney’s Cars and Planes, you were sure to get his attention. It didn’t take long for us to notice his constant need for toys in each hand, regardless of what we were doing or where we were going. He never had a dummy or took to a particular teddy for comfort, so I guess his toys were his comforter after all. Here we are now 5 years old and Sonny is still never found empty handed. You may not always see them in his hands but guaranteed his pockets are FULL! He takes as many of his toys up to bed with him each night and holds them underneath his pillow until he falls asleep. In the morning, they are back by his side, next to him as he eats his breakfast and they go into school with him too. It’s not a case of giving in to demands or spoiling him, they have an important purpose. Just when I thought I had ran out of options, I came across Zippy Spinners while browsing my Instagram feed and straight away, was intrigued by them. Sonny was lucky enough to be sent a zippy spinner and we were all super excited to receive our gift in the post. Sonny was recovering from chicken pox when our spinner arrived and was gratefully received by a very anxious, itchy and scratchy little boy. Our spinner is blue which is Sonny’s favourite colour. It arrived neatly packaged in a velvet drawstring bag. I was really pleased with the quality and design of the spinner and you can feel how well made it is. In the past I have brought fidget toys that felt cheap and flimsy but our spinner is not like this at all. Before showing Sonny, I had a little play around with the spinner myself. It is light enough to be held in one hand, but strong enough to be placed on a surface and spun that way. It has a spin time around 2 minutes from start to stop. Sonny was excited when he held the spinner for the first time and like a duck to water, knew just what to do. He stood with it held in one hand and spun it before sitting on the floor next to his little brother Zachary and showed him how his new toy worked. Sonny was fascinated with how smoothly it spun and watched it come to a stop before setting the spin in motion once more. Our spinner is always placed on the side and often Sonny will pick it up and play with it. 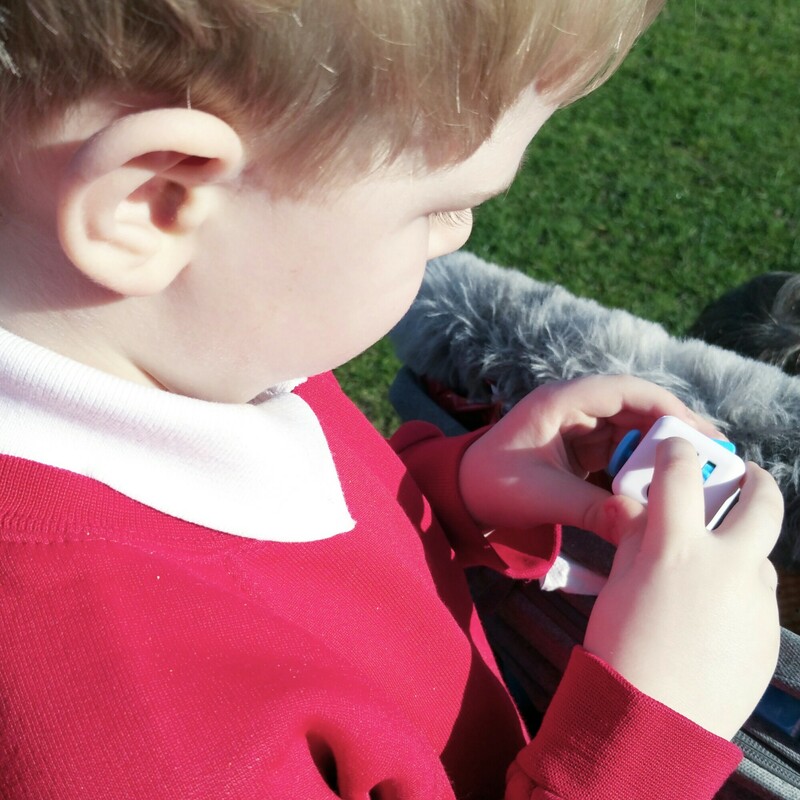 We have it tucked in the hood of our pushchair and Sonny will play with it on the way to school as he stands on the buggy board. Sonny is not the only one now fond of his spinner, even my other half comes home from work, picks it up and begins spinning it and balancing it on one finger. We have had our friends and family, both young and old ask where we found it, that they need to have one. I have had it both in my coat pocket and at my desk at work. I have found myself spinning it while concentrating or generally as a way of channelling social anxiety. There is something so instantly calming, almost captivating about these spinners. I found it easy to pick up and incredibly hard to put down. This Zippy Spinner retails at $12.99 (Approx. £10.48) To purchase a spinner, visit the Zippy Spinners website by clicking here. You can also shop on Etsy. Kat is a 36 year old single mother to her beautiful daughter Frankie Mae, aged 3, living in Illinois (US.) Her daughter is currently awaiting assessment for Autism and has been receiving speech and language support for over a year. Kat also has young relatives with additional needs, including Autism and Downs Syndrome. It was while attending speech and language sessions with her daughter, where her passion for products designed to help those with sensory difficulties began. Kats’ love for her daughter, along with a strong desire to move back to Las Vegas, inspired her to pursue a career which enabled her to work from home, spending more time with her daughter whilst doing what she enjoys. Kat began a series of extensive research to ensure the best possible products were found and so, Zippy Spinners was born. Kat aspires to be a successful and independent woman, praising her mum, Peggy for her love and support, providing her with the opportunity to become so. Disclaimer – We received a complimentary Spinner courtesy of Zippy Spinners. All views and opinions are entirely my own. Ooo I think I definitely need to look into getting some of these both for home and for school. I can easily see that both my daughter and my students will love them. Thank you so much for linking this post up to #PostsFromTheHeart so I could discover them. You really make it appear so easy with your presentation but I in finding this topic to be really one thing which I think I’d never understand. It seems too complex and extremely large for me. I am having a look ahead on your subsequent submit, I’ll try to get the cling of it! I’m no longer positive the place you’re getting your information, however good topic. I must spend a while studying much more or working out more. Thanks for magnificent information I was searching for this information for my mission.